What I noticed on Sunday, March 24, as I listened to stories at The Toronto Reference Library, was the gift of “seeing” so much of the stories! I saw a bask of hungry baby crocodiles, swimming up the river. I saw blueberries spilling from a basket, tipped over by a gate. 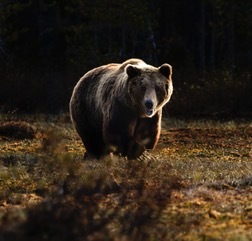 I saw an enormous brown bear, standing tall, arms outstretched, at the edge of a meadow. I saw a King pull an arrow from his quiver and pull it taut upon his bow. I saw the devil’s black coat and hat and gloves. I saw a broad winged dove, sweep down to the riverbank, with a sleeping baby on his back.